Known as the Turner House, it was built in 1880 of pine logs by L. H. Lay, at Sinking Creek in Laurel County, and was the home of John Moses Turner (1892-1987). It is saddle-bag style, with the space between the two sections closed in. 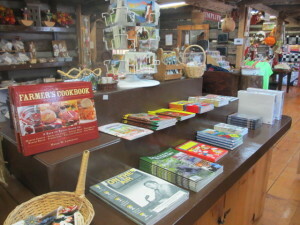 Today, it is filled with fine crafts made by local artisans and is used as the beginning and ending place of the tour. View a short introduction video and a Kentucky Long Hunter display. Built of logs and planks for a durable, practical workshop. 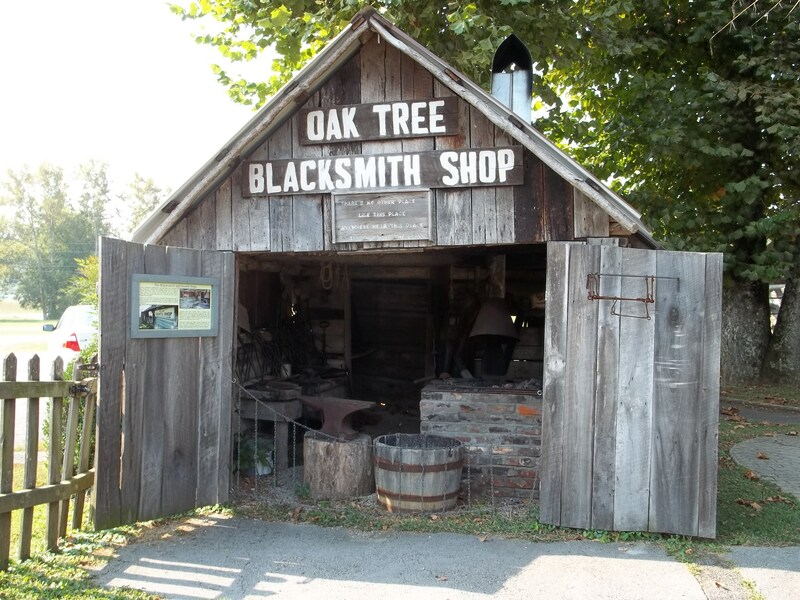 Contents include: Dual forge (Bellows, Sears and Roebuck 1885 – $2.50), crank-powered blowers (late 1800s), two anvils (basic tool in any shop), hammers, tongs, nippers, bench vice, drill press, and a creasing or bending machine. Two-holer, built in 1946. Once as common as today’s modern bathrooms, they are now very rare. From Capt. Wm. C. Bryant’s homestead (Civil War era). This shop was used for trimming hooves and putting the shoes on a horse or mule. Contents include tools for shaping horseshoes for a proper fit. Also from Capt. Wm. C. Bryant’s homestead. It was built in 1860 of yellow poplar logs. 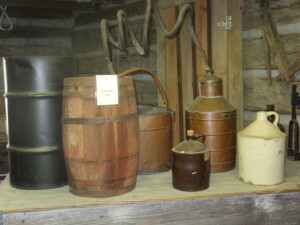 Contents include wagon jacks, buggy jacks, scythes, cross-cut saw, one-man saw, pit or whip saw, mining tools (track bender, auger, coal shovel and pry bar), grindstone, fodder chopper, a wagon (made in Owensboro, Kentucky), a collection of plows, horse-drawn dirt scraper, meat salting box, quern (hand operated grist mill) and corn shellers. (1884) A fine example of the one-room cabin, with a sleeping loft above. 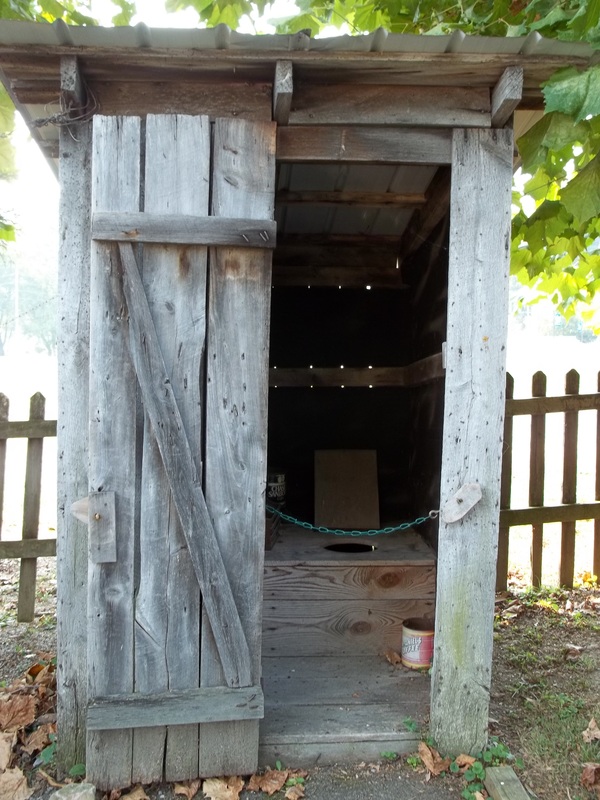 This cabin comes from the Skaggs Trace section of Laurel County. Furnishings include an iron cook stove (1885-1890), iron bed ($2.95 Sears and Roebuck), homemade straw mattress, handmade quilts (Dutch Girl & Rooster patterns), blanket made of homespun wool by Mrs. John Hopper in 1882, walnut veneer dresser (1800s), homemade willow table/wash stand, quilting frames hung from the ceiling, and a double slate-board for children learning to cipher. 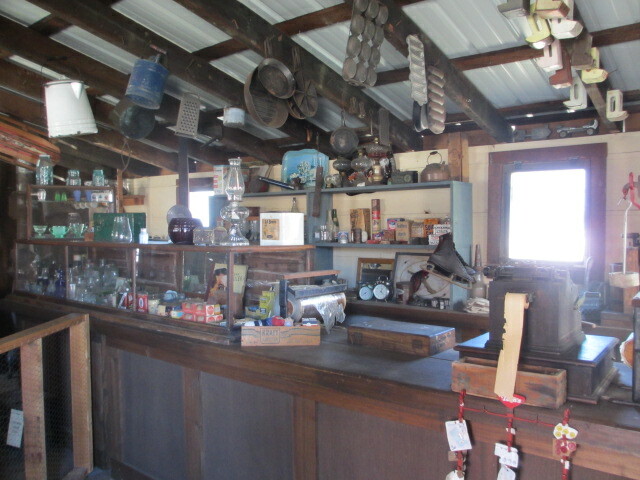 Replica of the store, post office and barber shop at Place, Kentucky, which served as a community center. Contents include the old counter and showcase, an Enterprise coffee grinder, platform scales, canned foods, tobacco products, patent medicines, coal oil cans, ice box, a rare collection of “graniteware” cooking utensils, dry goods, vinegar barrel, antique safe, potbelly stove, hand clippers, shears, straight razors, razor straps, mugs and authentic postal window and boxes of the period. THE COBBLER’S SHOP is in the other end of this building. 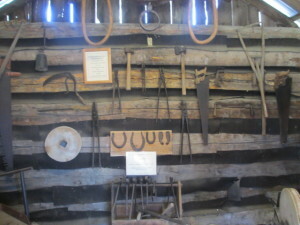 Contents include leather working tools such as shoe lasts, hammers, knives, a shoe stretcher, needles, and other displays such as an 1859 Civil War saddle, saddlebags, sidesaddle, two sets of mule or horse harnesses, along with trace chains from the Wildcat Mountain battleground. Typical two-room cabin of yellow poplar and chestnut logs (Clay County, 1857). 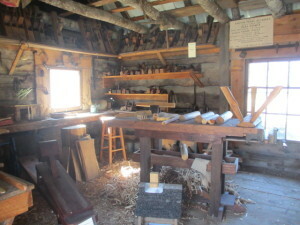 THE WOODWRIGHT’S SHOP in one room contains a collection of woodworking tools from the 1800s and earlier. Such tools include the spring-pole lathe, shaving horse, drawing knives, hammers, planes and molds for shaping wood, a 1918 multi-head drilling machine and a drill used in building barns which made holes for wood pins. 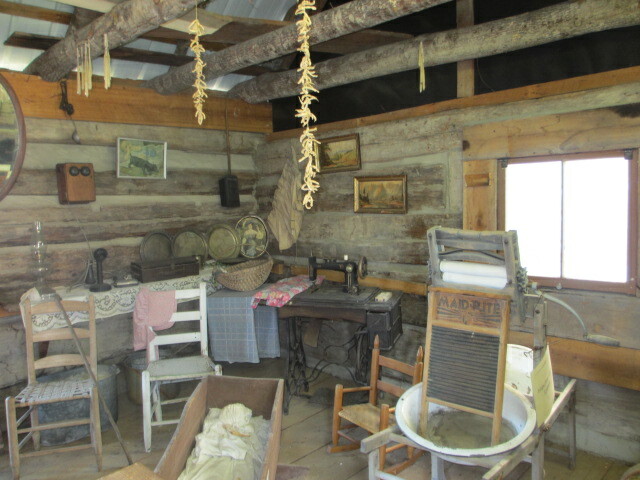 We use the other room as a TRIBUTE TO THE PIONEER WOMAN who played an important role in keeping the homestead while the men were away for long periods of time hunting. The pioneer woman had to be strong, brave and know how to use a gun. Built in three stages: The first part was built in 1790-1792, out of “V” notched pine logs. The second part of this saddle-bag cabin was built in 1860 using the half-lap notch. 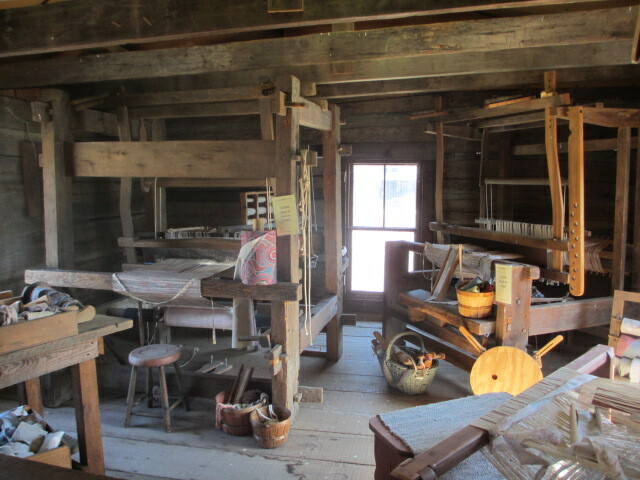 This section we use as THE BROOM SHOP with original broom machines from Shakertown, a kick wheel powered twisting machine, vices, trimmer, wire to wrap the broom, strings and needles for sewing the broom and broomcorn. The upstairs was added in 1870. 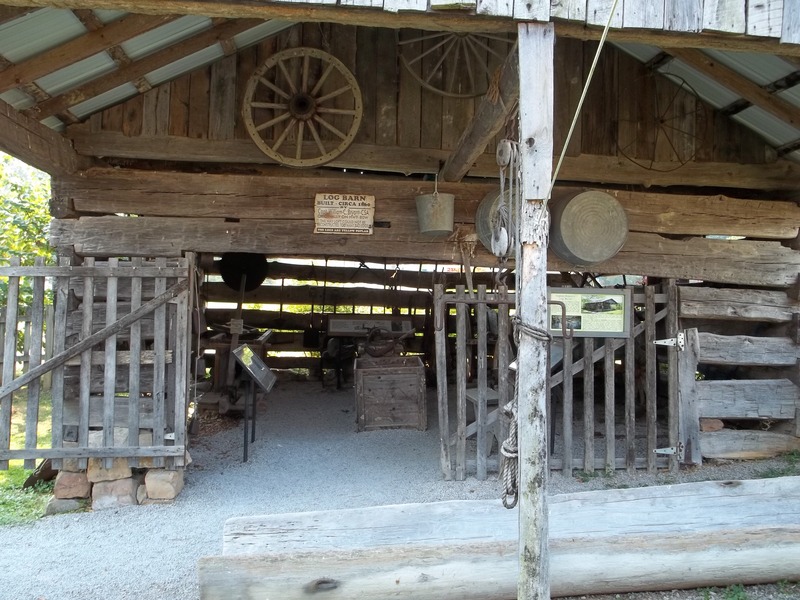 During the Civil War this house was used at various times by the Union & Confederate troops. 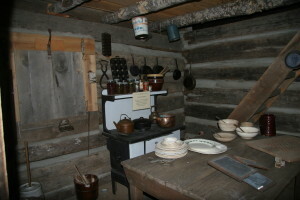 Displays of frontier life fill the cabin. 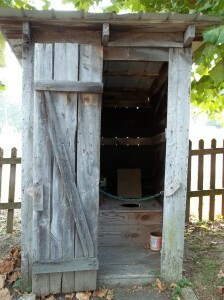 A “modified” dogtrot style cabin, actually made by combining two cabins. 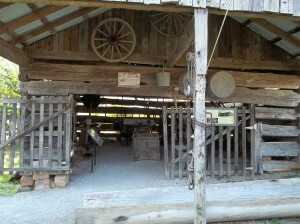 The Stump section is of red oak logs, built about 1887 near Raccoon Springs (Wilderness Road), in Laurel County. The HEIRLOOM ROOM is a collection of interesting historical items that have been handed down from generation to generation, including our newest addition – a collection of over 1,000 hammers. 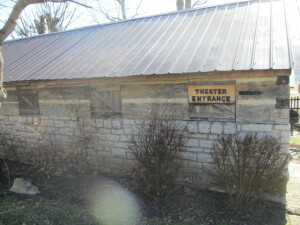 The Fouch section is made of yellow poplar logs, and was built in 1807 near the site of a major Civil War battle around Mill Springs in Pulaski County. John Fouch was an uncle of the famous U.S. senator John Sherman Cooper. 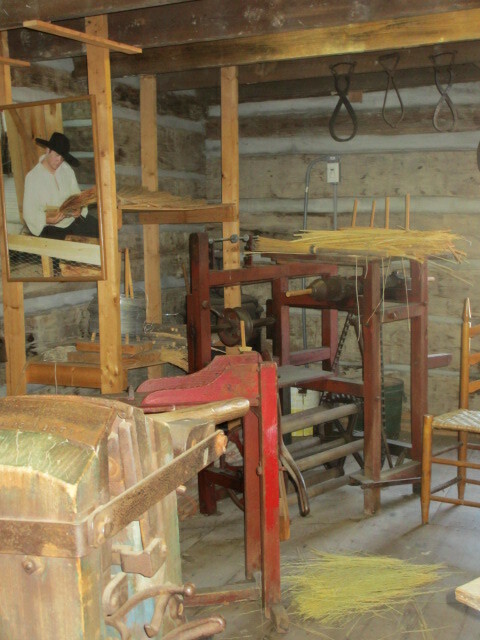 The LOOM HOUSE contains the “Barn” or “Four Post” loom, made of pine in Virginia in the late 1700s and a smaller loom that was made in Madison County, Kentucky in 1860. 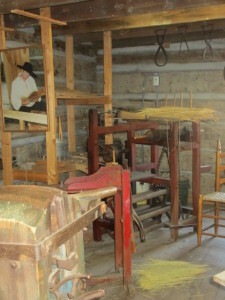 The third loom was made by W.R. Mays of London, Kentucky, who spent many years locating and assembling this cabin village and its contents, which he later sold to the Mt. 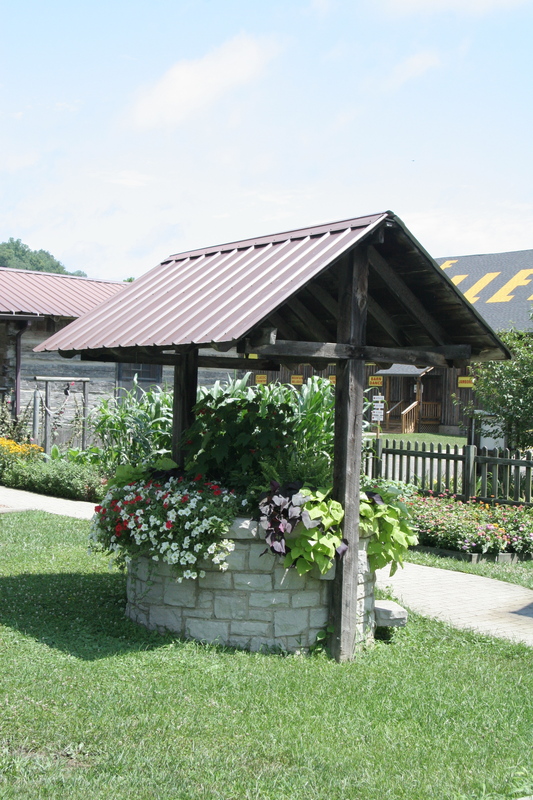 Vernon-Rockcastle County Tourist Commission. According to the founder of the Renfro Valley shows, John Lair, this well marks the spot of the first log cabin built in Renfro Valley in February of 1791. John and Lula Renfro were the first settlers. John’s brother, James was an early explorer and gave the creek its present name, Renfro Creek. Mr. Lair also erected a marker in the old Hiatt Cemetery across the road, in memory of John and Lula Renfro.